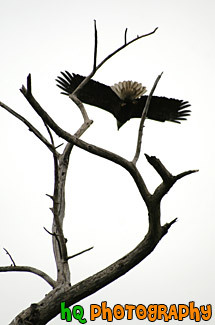 #1225 — A close up picture taken of a bald eagle with its' wings spread as it took off for a flight after resting on the tree branches seen. 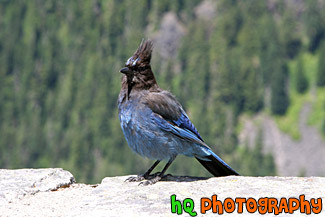 #1650 — A scenic close up picture taken of a blue bird standing on a rock and looking at the camera in located in Mt. Rainier National Park, Washington. #321 — A scenic picture of a pink flamingo taken at the San Francisco Zoo. 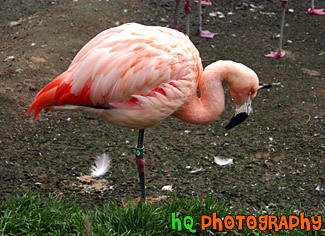 Flamingos are tropical birds, although large colonies have been observed high in the Andes. Its plumage is vermilion with black-edged wings; a common Asian and African flamingo is scarlet with black wing feathers. The flamingo scoops its large bill backward through shallow water in marshes and lagoons. When closed, the serrated edges of the bill strain from the muddy water the aquatic plants, shellfish, and frogs on which the bird feeds. 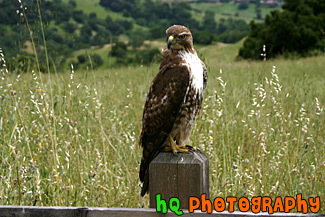 #1393 — A scenic vertical picture taken of a brown hawk sitting on a wooden fence post in Palo Alto, California. 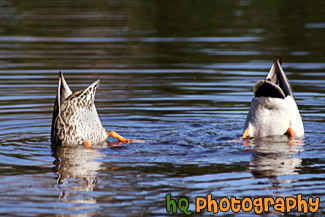 #975 — A silly photo taken of two ducks diving under water to search for food. 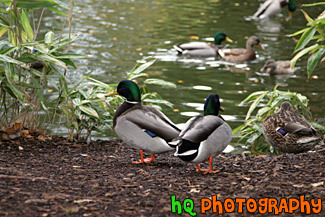 These ducks were found in Lake Bradley which is locted near South Hill (Puyallup), Washington. 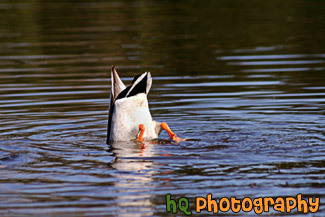 #978 — A close up funny photo taken of a duck diving under water in a lake to search for some food. #883 — A scenic picture taken of the back or side view of a white goose found along the side of a road in Washington State. True geese are medium to large birds, always associated to a greater or lesser extent with water. Geese have been domesticated for centuries. 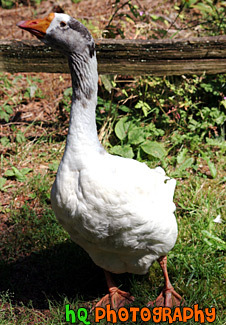 In the West, farmyard geese are descended from the greylag, but in Asia the swan goose has been farmed for at least as long. All geese eat an exclusively vegetarian diet, and some can become pests when flocks feed on arable crops. Geese tend to lay a smaller number of eggs than ducks. However, both parents protect the nest and young, which usually results in a higher survival rate for the young geese, known as goslings. 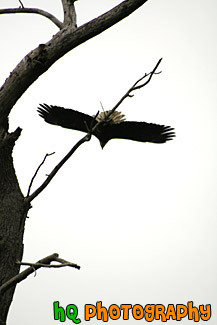 #1255 — A scenic vertical picture taken of a bald eagle flying off a tree branch with its' wings spread. 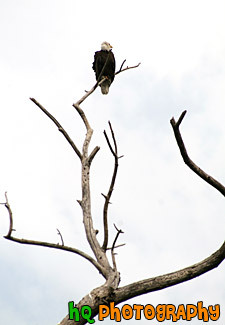 #1802 — A scenic vertical picture taken of a bald eagle sitting on a tree branch with blue sky seen behind. 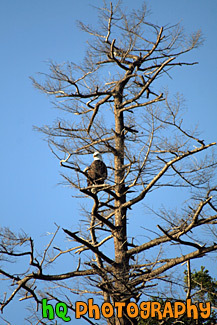 This eagle was found near Deception Pass in Washington State. #1226 — A scenic picture taken of a bald eagle sitting on a tree branch located in Washington State. 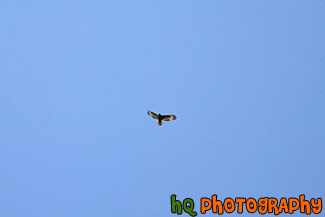 #2012 — A scenic picture looking up at a bird flying with its' wings spread in blue sky on a sunny day. 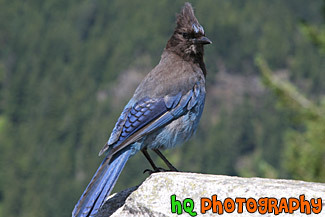 #1644 — A close up picture taken of a blue bird with a black head standing on a rock. This bird was found in Mt. Rainier National Park, Washington. #1018 — A close up scenic picture taken of a brown goose with a black neck and face. This picture was taken on a sunny day at Lake Bradley in Puyallup, Washington as you can see the shadow from the goose on the ground. You can also see part of the lake in the background. #1020 — A close up picture taken of a brown, black, and white goose walking out of a lake located in Puyallup, Washington. This picture was taken on a sunny day. 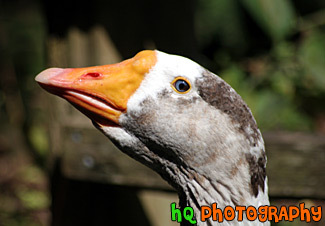 #622 — A close up picture taken of a goose's face. In this picture you can see it's orange beak and gray and white patched face. 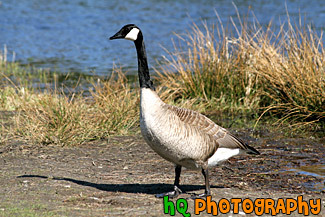 True geese are medium to large birds, always associated to a greater or lesser extent with water. Geese have been domesticated for centuries. In the West, farmyard geese are descended from the greylag, but in Asia the swan goose has been farmed for at least as long. All geese eat an exclusively vegetarian diet, and some can become pests when flocks feed on arable crops. Geese tend to lay a smaller number of eggs than ducks. However, both parents protect the nest and young, which usually results in a higher survival rate for the young geese, known as goslings. 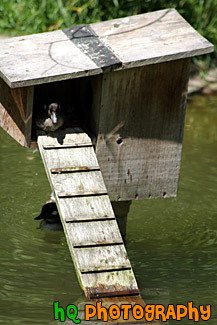 #958 — A scenic picture taken close up of a duck sitting down in a wooden "duck house" located in a pond at the Woodland Park Zoo in Seattle, Washington. The duck house has a wooden ladder that goes from the house down to the water for the duck to walk down. #11 — A close up picture taken of a duck sitting in a lake. This duck was floating among the shore of Bradley Lake which is located in Puayllup (South Hill), Washington. 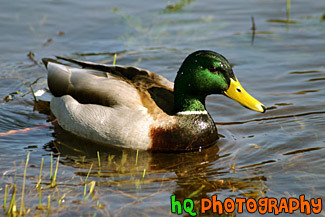 This duck is colorful as it a yellow beak, green face, and brown, black and white seen over its' body. #1801 — A scenic picture taken of some ducks on the outside of a pond and others seen in the background that are swimming in the pond. 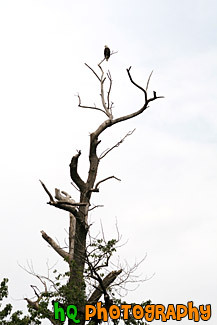 #1257 — A scenic vertical picture taken of a bald eagle sitting on top of a tall tree. 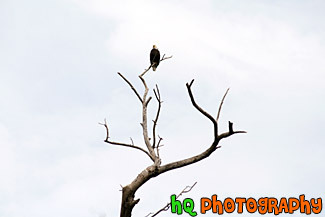 #1258 — A scenic picture of a bald eagle sitting on top of a tree branch. 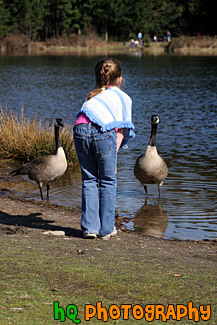 #977 — A scenic picture taken of a little girl trying to feed a couple of geese located near Lake Bradley in Puyallup, Washington. These geese let the girl get exceptionally close to them. 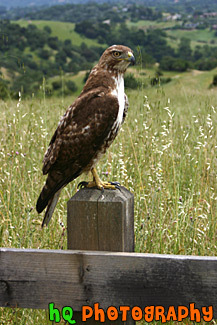 #382 — A scenic picture taken of a still hawk on a post in the hills of Palo Alto, California. This hawk is looking at me as I get closer and is deciding whether to fly away or not! 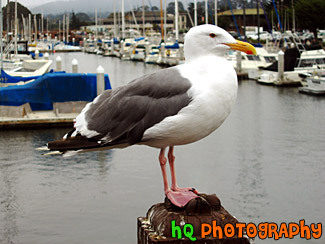 #257 — This photo is a close up of a white and gray seagull taken in Monterey Bay, California. #886 — A close up picture taken of a seagull bird flying in the air while looking down. 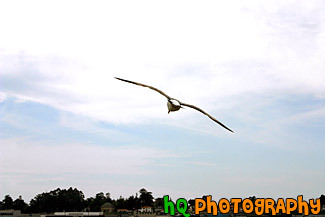 This seagull was flying over the ocean and beach at the Santa Cruz Boardwalk in California. 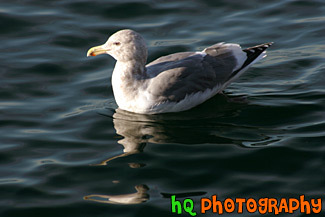 #828 — A close up picture taken of a seagull swimming near the shore of the Puget Sound in Seattle, Washington. In this picture you can see the reflection of the duck in the waves of the water. 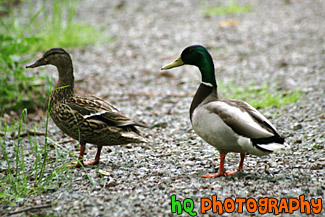 #1228 — A close up photo taken of two ducks. One is brown and the other is white and gray with a green face. 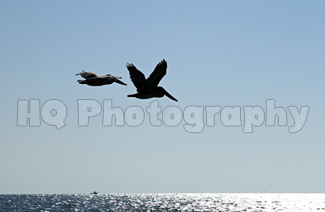 #2029 — A close up picture taken of two pelican birds flying over the Gulf waters off of the Florida coast at Siesta Key Beach. 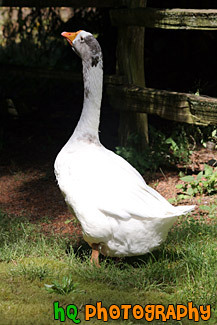 #659 — A close up picture taken of a white goose found along the side of a road in Washington State. 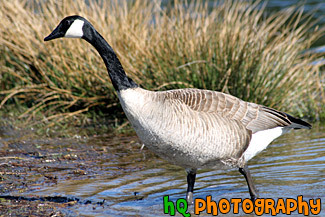 True geese are medium to large birds, always associated to a greater or lesser extent with water. Geese have been domesticated for centuries. In the West, farmyard geese are descended from the greylag, but in Asia the swan goose has been farmed for at least as long. All geese eat an exclusively vegetarian diet, and some can become pests when flocks feed on arable crops. Geese tend to lay a smaller number of eggs than ducks. However, both parents protect the nest and young, which usually results in a higher survival rate for the young geese, known as goslings.